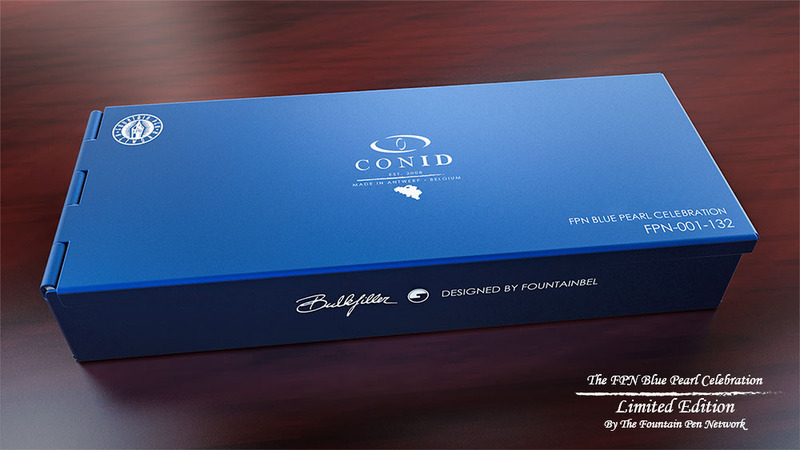 As we have been able to strike a very good deal with CONID, as we do not have any large overhead costs being a volunteer run organization, and as we are doing this as a Group Buy with prepayments for this pen, we are able to initially offer this exquisite and stunning piece for the extremely discounted price of 929.75 euros excluding VAT, 1125 euros including VAT, or US $ 1125 (incurs high currency exchange costs) for those living outside the European Union, excluding shipping costs and any nib work if so required. We need an initial order of 20 pens to be able to start production, and we would like to have at least 20 sold the latest towards the middle of September (2015 ). 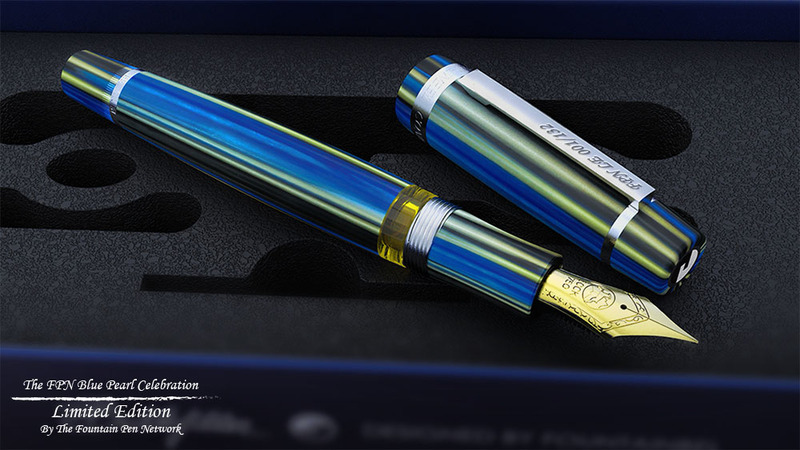 That would allow for production to start towards the end of September, and with an estimated processing time of 6 to 8 weeks, that would mean that these pens will be in your hands before Christmas this year. Because of the high value of these pens, shipping will only be done express, by courier, or fully insured. I am sure you will forgive us for doing so . Yes ,it will add to the cost, but we think it is absolutely worth the extra trouble. If there Is demand for other shipping methods, beyond the two we currently offer, we will add them - we are currently negotiating with UPS for fully insured express shipping. Do note that the express shipping we offer currently, is only insured up to a value of 500 euros, which will therefore all we will be able to refund in case of damage or loss during shipping or transport. The fully insured shipping is a bit slower, it is priority shipping worldwide. 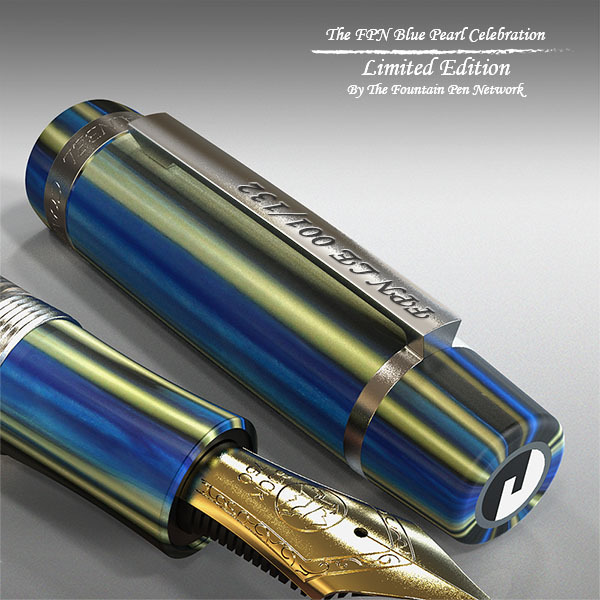 It's a absolutely beautiful stunning pen! Thanks! And it is available in our store now . BTW, a nib modification service is available. Just ask, and we will add the options to our store as well. I would very much like to order a broad stub nib, hopefully something like 1.1mm if that is possible. 1.3mm would not be too much, but it probably is too much to hope for. 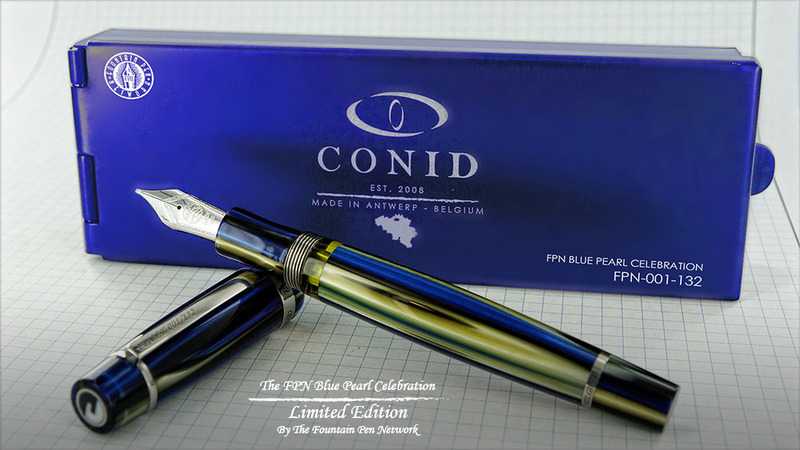 As we have been able to strike a very good deal with CONID, as we do not have any large overhead costs being a volunteer run organization, and as we are doing this as a Group Buy with prepayments for this pen, we are able to initially offer this exquisite and stunning piece for the extremely discounted price of 929.75 euros excluding VAT, 1125 euros including VAT, or US $ 1125 for those living outside the European Union, excluding shipping costs and any nib work if so required. I'll check whether that is possible. Normally a Broad nib is 0.8 mm wide, and we generally are able to get the widest possible stub out of it. However, the tipping may be wider it is done the same way as it is with the F nib. Only F, M and B are available, due to the limited natured of this edition, so we do have to work from these nib widths for any modifications. That's a good one, thank you for letting me know. Upon checking, this is due to the conversion rates used by our payment provider, when going from USD back to Euros. We have to pay for these pens in Euros, so we incur an extra conversion at a USD rate which is almost 10% lower than one would expect. This is why there is this difference. In order not to have to change this on a daily basis (it varies between approximately 8% and 10%), we have adjusted the USD price accordingly. We use USD in our store as that is the standard currency for all our transactions, and the store currently can only handle a single currency. However, if you'd prefer to pay in Euros, where we don't incur the extra currency exchange fee, do contact me backchannel for the details. We'll check if we can add this info to the store item itself too. Ok, instructions to pay in Euros, and save approximately 10% on the price, notably for those paying from accounts in other currencies than USD, have been added to the individual store items for the pen . Just scroll to the bottom of the description to see the instructions. Yes indeed. Banks and intermediaries always score, whatever one does . I was totally flabbergasted with the final outcome on the 2012 LEs. I had never in a million years expected to end up paying as much as we did to all the intermediaries. One gets charged to receive a payment to start with, an exchange rate commission, a low exchange rate, a transfer fee, and another commission and payment fee on the actual bank account, and the receiver of the funds also gets punished. And it is good we can all do this electronically these days, otherwise it would eb even worse - additional charges for the paperwork involved. Update: I just got confirmation that both are possible . The B nib allows for a 1.3 stub to be made of it, the M a 1.1. This thanks to the royal tipping used on the #8 nibs. I will add these options to the pricelist, just give me a couple of days. And yes, those choices would have to be made later, as pricing mentioned is solely for the pen. If you'd prefer a 1.0 mm line width, it would only need an M nib, so I will change it for you. I will do so tomorrow, as I need to finish something urgent first tonight. We'll just get our first order out once we reach 20 pens sold, and take it from there. As mentioned, production takes about 6 to 8 weeks from our order, and we need to have sold 20 pens first. So far, the count is 3 . In order to pay by bank transfer, do contact me backchannel please. Do still go through the store purchasing process, and do let me know once you've cancelled the PayPal payment as per the instructions. I'll check if we can add the bank transfer info as well to the process. Do note that bank transfers will take up to 5 days or so in Europe to show up, so the invoice generated by the system will not show that it has been paid until we have received the money in the FPN bank account. With PayPal that is more or less instantaneous. 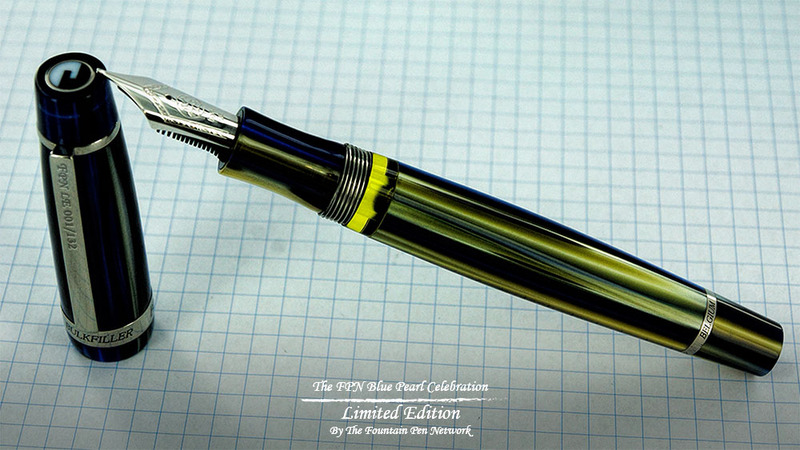 Beautiful looking pen, really beautiful. Sadly I cannot raise the funds in time for the offer so I am left with only vicarious experience again. A longer lead-in/heads-up time would at least give people like me a fighting chance of competing. You have, actually. We need the first 20 pens to be ordered asap, and thereafter we can order the remainder in batches of 10 . Considering the number of LEs available, I doubt all of them (at least 100, and up to 132, material available permitting) will be sold out before Christmas . COR !!! Absolutely gorgeous. Congratulations. . . .
Ah, I see. In that case I shall have to examine the financial future for the next few months. NZ$1900 is alot of money to try and save up. (I daresay I am not the target demographic they want, but I can dream). Edited by Empty_of_Clouds, 13 August 2015 - 22:28. Yes, isn't it just . Anyway, for those preferring to pay in Euros, we now have added an extra shipping option to temporarily exclude shipping costs, for it to be selected at a later stage, after we order the pens from CONID, but prior to shipment of course. We have adapted the instructions to use this option as well in that case.